South Asia experienced the worst monsoon in decades with record high rainfall recorded in parts of Northern India, Bangladesh and Nepal over the last two weeks of August, 2017. Over 41 million [i] people were affected throughout the region and 1200 deaths reported. In Nepal, severe flooding affected 35 out of the 75 districts, with the six worst hit districts — Saptari, Siraha, Mahottari, Rautahat, Banke and Bardiya- all lying in the Southern plains of Terai, while almost a third of Bangladesh, a total of 35 districts in the north, were submerged by the floods. According to the latest figures, more than 20,888 families [ii] in Nepal still remain displaced and more than 106,000 people [iii] are taking refuge in 335 shelters in Bangladesh. Affected communities urgently require food and nutrition interventions, water, sanitation and hygiene (WASH) and health support. Though different humanitarian groups have been providing emergency assistance to the flood-affected communities, more needs to be done and critical gaps still exist. Under these circumstances, ACT member ICCO Cooperation Nepal together with CCDN, with support from Kerk in Actie (KiA), mobilized a relief operation in Rautahat district of Nepal, where more than 48,452 households have been affected by the flooding, leaving them in need of urgent emergency assistance. In coordination with the District Disaster Relief Committee (DDRC), Armed Police and local authorities, a relief distribution plan was devised targeting 600 of the most vulnerable households in Gaur and Saruatha in the Rautahat district. Each family received a month’s supply of food parcels containing rice, lentils, spices, cooking oil, and basic water purifiers and mosquito nets. “The flood washed away our belongings. Not that we had too many things to begin with. My husband is no more, so it is my responsibility to feed my children and keep a roof over their head. I could not give them a full meal in the last five days. Now that I have received the relief package, my burden has been halved. 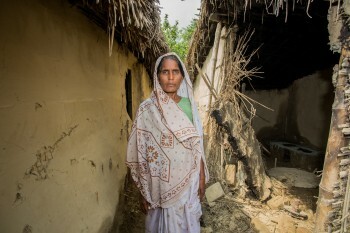 I can be sure that, at least for the next month, my children will eat well again” shared 44 year old Shamsun Khatun. 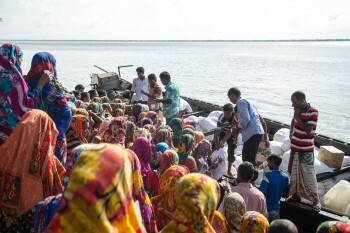 Similarly, in Bangladesh, ICCO Cooperation responded to the flooding in three unions of two upazilas under Gaibandha district in coordination with government officials of Gaibandha district, union parishad chairman and GUK Gaibandha. The relief operation reached out to a total of 2300 households with food parcels and 1085 households with agriculture input support for the most vulnerable members of the community. Included in the agriculture input support were seeds for most popular and common vegetables for cultivation like bottle gourd, country bean, and Indian spinach, among others. Additionally, ICCO partnered up with Shongjog (the multi-stakeholder platform on Communication with Communities in Bangladesh) to pilot the use of AKVO RSR (Really Simple Reporting), a web and android based online communication and monitoring tool. RSR served effectively as a community engagement tool to collect and disseminate the voices of the affected population, thereby promoting comprehensive two-way communication (CwC), so that relief and recovery activities of humanitarian actors are responsive to the issues that are most strongly felt in the communities they serve. The updates (short articles/quotes with photos or videos) cover their current situation, needs and challenges, and feedback on ongoing response activities. It has proven to be an effective tool for coordinating activities, sharing the (latest) needs of the community, monitoring progress, and exchanging learnings with other development actors to ensure greater transparency and avoid cases of duplication. “All my crops were washed away in the floods. Not only that, I also lost my livestock and my house is partially damaged. My losses are close to 60/70 thousand taka. How will I recover such a big loss? Who will help me? It would be great if you could provide some livestock support. At least then, I could begin somewhere to rebuild my livelihood,” shared Hosain Ali through the RSR platform. Moving forward, ICCO is now assessing the longer term needs of the community in Rautahat and Gaibandha for livelihoods and economic recovery. Given that over 600,000 hectares of prime farmland and crops under cultivation were destroyed by the flooding, it is safe to say, the communities will require all the help their local governments and development actors can provide. "All my crops were washed away in the floods. Not only that, I also lost my livestock and my house is partially damaged. My losses are close to 60/70 thousand taka. How will I recover such a big loss? Who will help me?"